Tickets are now on sale for Garden Glow 2013, the Missouri Botanical Garden’s first-ever winter light exhibit. Visitors will have the opportunity to stroll through the Garden at night surrounded by a spectacle of unique light installations. The exhibit opened Nov. 23, 2013 and runs through Jan. 4, 2014. Tickets are date-specific and sold in limited quantities. Tickets can be purchased in advance at www.mobot.org/glow. 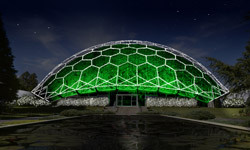 For the first time in the Garden’s history, hundreds of thousands of lights will adorn the Climatron®, Kaeser Memorial Maze, Central Axis, Tower Grove House and other iconic locations with unique color combinations. Walkways will be transformed into sensory light tunnels as visitors experience the exhibit’s visual magic. There will be music throughout the installation including a “Snow Ball” in the Central Axis complete with “Dr. Frost and the Freeze Team,” a disc jockey and dancers who will lead choreographed routines and encourage visitors to join in the performance. The exhibit will also include a traditional candlelight village and an interactive area where visitors can decorate life-size snowmen. Food and drinks will be available at a number of locations on the grounds including stations featuring fire pits for s’more-making. Special Glow gear will be sold throughout the grounds and in the Garden Gate Shop. For general information, visit www.mobot.org or call (314) 577-5100 (toll-free, 1-800-642-8842). Follow the Garden on Facebook and Twitter at www.facebook.com/missouribotanicalgarden and http://twitter.com/mobotnews. More than 45,000 households in the St. Louis region hold memberships to the Missouri Botanical Garden. Memberships begin at $65 ($60 for seniors) and offer 12 months of free general admission for two adults and all children ages 12 and younger, plus exclusive invitations and discounts.Members help support the Garden’s operations and world-changing work in plant science and conservation. This entry was posted on Wednesday, November 27th, 2013 at 10:59 pm and is filed under December 2013. You can follow any responses to this entry through the RSS 2.0 feed. Responses are currently closed, but you can trackback from your own site.